London has a problem: a severe lack of housing. Further, it has one of the lowest population densities of any European capital city – most areas of Paris are far more densely populated [see this excellent comparison from Wikipedia]. It’s mostly thanks to all those rows of red brick houses that make up most of London’s suburbs. So while inhabitants here might get a tiny bit of garden, they also at the moment get sky high rents and very long commuting times. I’ve written previously about some of these issues here. So what are we supposed to do about it? The government has announced plans that it wants to build thousands of new homes in the South East of England. The population is projected to grow as the economy in the region remains strong. Some of these houses will be on brown field sites, and there are other plans to build tunnels over railways and build on those. However, the green belt to the North of London seems to be under some threat. Have a look at this from The Guardian for an overview of the issues. But the question remains: why are we not building upwards? This issue is raised in this interesting column in the SÃƒÂ¼ddeutsche Zeitung today. The argument is that if cities in the rest of the world are building plenty of super-tall buildings, why are European states not doing the same? The argument runs that as the world becomes ever more city-based, and at the same time energy resources become more scarce, we will not be able to adequately afford to live in cities that continue to sprawl outwards. Instead the solution is to build upwards. The UK’s financial district has continued to do this in London, with constructions like The Gherkin and at Canary Wharf. 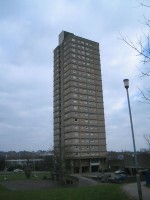 But high-rise housing developments have been essentially abandoned since the 1960s when monstrosities like the one pictured [pic: Wikipedia]. Are we just too nervous to contemplate building such towers in the future? Do the traditional wishes of the traditional British family continue to totally dominate the housing policy of the government? BoKlok for Gateshead, ISO freight containers for London?